Practically all observers in Ukraine and Donbass, besides representatives of Ukrainian officialdom, have noted the high casualty count among Ukrainian troops and the militants of the Ukrainian neo-Nazi battalions. Unofficial Ukrainian sources have also stressed that lack of military advisability of advancing 100 meters forward (what Ukrainian propaganda calls the UAF’s “creeping offensive)” at such a high price. Over the course of its recent offensive actions, Ukraine has used the time-proven method of dramatically understating losses. However, this time the losses are understated by dozens of times. For example, during the first, most fierce firefights between January 29th and 31st, the UAF reported 2-4 killed. At the time, the DPR’s artillery was holding off both the UAF’s forward positions and the second line of Ukrainian reserves. More realistic data on UAF losses has come in recent days. According to the press center of Ukraine’s so-called “Anti-Terrorist Operation”, on February 3rd the UAF lost four servicemen in Donbass and 17 were wounded. For a “ceasefire,” these are very high losses. But in fact, during the hottest firefights over the past days, their losses have been dozens of times higher. The bodies of many fallen Ukrainian soldiers, instead of receiving funerals, await a crematorium oven. According to other reports from Donbass, mobile crematories are actively working to burn the bodies of dead Ukrainian soldiers and neo-Nazi militants in order to not “disturb” official statistics. Another important source of testimony on UAF losses is offered by Ukrainian regional media and reports obtained from local residents. According to their reports, morgues are literally crammed with the bodies of Ukrainian soldiers not only in Ukrainian-controlled Donbass, but also in neighboring regional centers such as Dnepropetrovsk and Kharkov. Ukrainian wounded are crowding hospitals and civilian clinics in such cities of Ukrainian-occupied Donbass as Artemovsk, Konstantinovka, Chasov-Yar, Kramatorsk, etc. The fact that the wounded are being taken to more distant centers speaks to the huge number of sustained casualties. To illustrate this, let us provide a remarkable example from Dnepropetrovsk (renamed by Ukrainian authorities as “Dnepr”). According to a local news report: “Loads of wounded fighters are arriving in Dnepr every day. 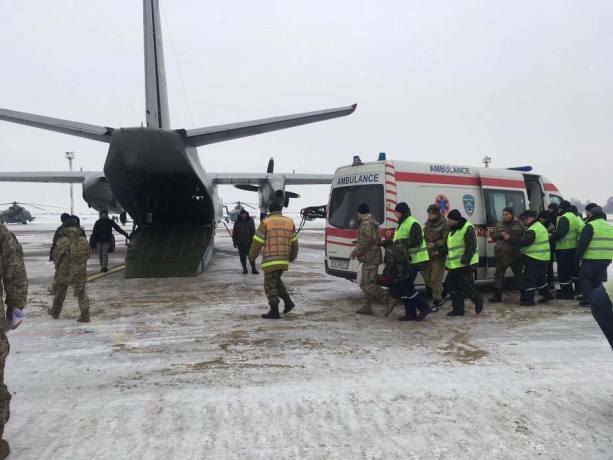 A string of ambulances is always rushing to and from the airport.” The publication asks the city’s residents to help the wounded and bring them blankets, warm clothes, tea, coffee, and sugar – all of these essential and inexpensive things are not even provided by the Ukrainian army’s command. 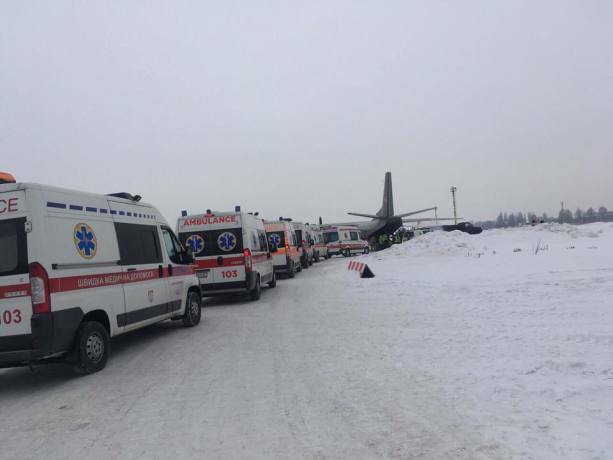 The publication also includes a photo of numerous ambulances on duty at the Dnepropetrovsk Airport. Interestingly enough, a comment under the article by one reader with the username “Hero of Bandera” (the leader of the neo-Nazi Organization of Ukrainian Nationalists and the ideological organizer of the massacre of the Polish population of Volhynia and ethnic cleansing in Western Ukraine, also an employee of the Nazi German military intelligence Abwehr) threatens the editor with SBU persecution and compares the publication’s employees to “separatists” on the grounds that the article published figures that discredit official statistics. Such commentary once again demonstrates the policy of intentional misrepresentation and the concealment of colossal UAF losses by the military command and political authorities of Ukraine. Of course, the DPR’s armed forces have also suffered losses and have most likely understated them, but nowhere near the extent that the Ukrainian side has. According to the spokesperson of the DPR command, Eduard Basurin, 18 DPR servicemen have since been killed by Ukrainian fire, and 34 civilians and 26 soldiers have been wounded. On the very first day of shelling, civilians were killed. Ukrainian artillery bombardments have also inflicted serious damage on residential buildings (numerous houses have been destroyed) and the social infrastructure of cities. Ukrainian shells’ impact has led to the ruin, full or partial, of numerous DPR infrastructure ensuring the supply of water, electricity, and heat to cities. In order for the foreign reader to grasp the situation, allow me to explain that Donbass was the most urbanized region of the former USSR. Ninety percent of the population lived in cities and to this day the population of Donbass remains concentrated in urban areas distinguished by close proximity between cities. For example, Donetsk, with a pre-war population of 1 million, blends in with the town of Makeevka with a population of 350,00 people. The distance between the cities is more or less a single kilometer. Therefore, the municipal authorities of cities have to endure increased work loads to ensure the smooth operation of urban infrastructure. It should be noted that Donetsk has beautifully coped with this work, as the city remains amazingly clean even in the midst of Ukrainian shelling. Emergency teams arrive immediately at the scenes of incidents and clean up the damage. Pipelines supplying gas to households and Donbass’ industrial enterprises, however, have consistently been faced with countless problems. To illustrate this situation, let us turn to a personal story to show the situation in Donbass through an ordinary citizen’s eyes. My friend Vladimir, a veteran of the founding of the DPR and a man around the age of 55, lives in Donetsk. Artillery bombardments of the city have led to the partial interruption of professional and public life. But despite the shelling, the bulk of the city’s inhabitants still wait at public transport stops for their bus, even while under fire, and even when classes in the city’s schools are cancelled. Vladimir’s friends work at a gas supply station and deal with the repairing of pipelines. One of them found himself under artillery fire and was wounded while doing repair work. Ukrainian artillery fire did not cease for several days and nights in a row. When I talked with Vladimir on Skype several days ago, I could hear the impact of Grad rockets as volley fire rocket launchers constantly interrupted our conversation. The next time we talked on Skype, I heard the explosion of a Tochku-U tactical missile. An hour later, it was reported that the DPR military had managed to bring down the rocket out of the air. Here are my personal photos depicting unexploded Tochka-U missiles near Makeevka in October 2014. When the intensity of attacks subsequently declined, the residents of Donetsk and Makeevka somewhat calmed down. But they still spent several nights without sleep as the Ukrainian army started shelling repetitively at 5:00 in the morning. The Special Monitoring Mission of the OSCE has since confirmed the death of several civilians from shelling in Avdeevka and Donetsk: “The Special Monitoring Mission confirms the death of several civilians and quite a large number of injured civilians in Avdeevka and Donetsk as a result of shelling,” the OSCE’s recent report reads. Even higher casualties among the civilian population have been reported by DPR spokesmen. According to Eduard Basurin’s report on February 3rd, since the beginning of the conflict’s aggravation, more than 20 people have been killed and 60 wounded. This is probably understated data. Therefore, the humanitarian price of Ukraine’s offensive in Donbass is much higher than is acknowledged by official authorities. In addition, observers have noted a high number of damaged homes in Donbass cities. The situation in Avdeevka deserves separate mention. It is from this city that the Ukrainians began shelling the positions of the DPR army and Donetsk, and it is here that OSCE observers were forced to admit the presence of UAF tanks. On January 30th, Ukrainian President Poroshenko interrupted a one-day visit to Germany for talks with Merkel to return to Ukraine under the pretext of preventing a “humanitarian catastrophe” in Avdeevka. Let us note, however, that Poroshenko, who so urgently left supposedly important negotiations with Germany’s Merkel, did not visit Avdeevka anyway. Accordingly, the Ukrainian side’s official story does not hold water. There is either no “humanitarian catastrophe” in Avdeevka, or Poroshenko is not busy with cleaning it up. I’ve spent quite a long time in Avdeevka, so I still have relatives and acquaintances there, thus rendering me quite well aware of the situation in the town. Based on what I’ve heard from Avdeevka residents, I can say that that there is no humanitarian catastrophe in the likes of what Ukrainian propaganda alleges. The humanitarian problems that do exist in Avdeevka are the consequences of the UAF’s offensive operations and attempts by President Poroshenko to escalate the situation in Donbass. Avdeevka’s residents are bearing all the hardships of a war unleashed on Poroshenko’s orders, but they have not been subjected to such shelling as the residents of Donetsk and Makeevka have, who are regularly bombarded by heavy artillery and volley fire rocket systems. According to my friends in Avdeevka, only one case has been reported: an apartment building was opened fire on from the direction of UAF positions. Fortunately, no one was killed or injured, but the houses were partially destroyed. The information hype surrounding “humanitarian catastrophe” in Avdeevka is used by Ukrainian propagandists and President Poroshenko to create the illusion of a Ukraine being subjected to mass attacks by pro-Russian militants at the hands of which thousands of Ukrainian civilians are dying. But this is nothing new. We can recall the efforts of local ethnocratic regimes in the former Yugoslav republics who, supported by CNN, created the myth of Serb atrocities in Sarajevo or Kosovo. The Poroshenko regime wants to replicate something of the sort today. As is clear from some American media sources which we cited in the first part, this has only partially succeeded insofar as Avdeevka has been afforded special attention in describing the humanitarian situation in Donbass. But no one in the West is talking about the murder of civilians in the DPR and LPR, such as in Stakhanov, a small town in the LPR with a population of approximately 50,000 people that has lost four civilians and 15 wounded over the past two weeks. In the next and final part, we will address the burning question: why has Poroshenko launched a new war in Donbass and what is in store for him and Ukraine?